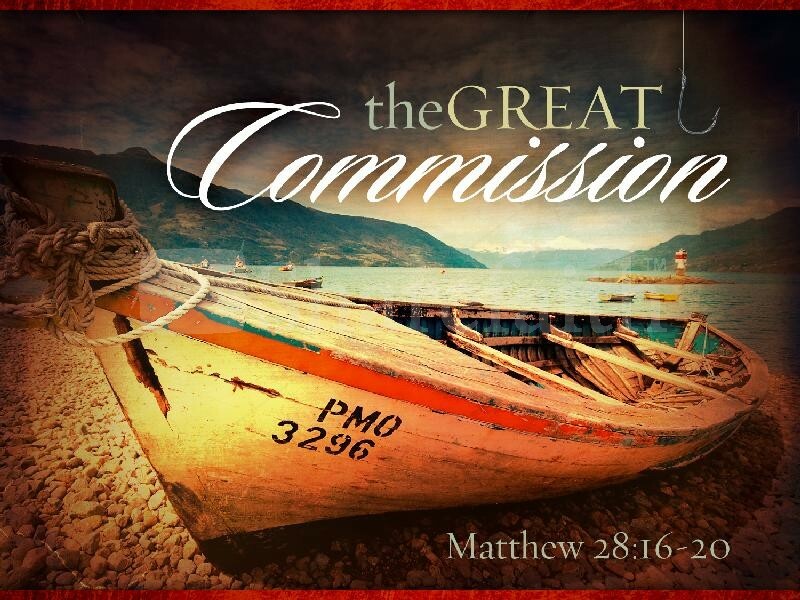 Over the last two weeks we looked at the great commandment, and today we look at the great commission, which is contained in the verses before us. Sadly this is more than often the ‘great omission’ and not the ‘Great Commission’. Our faithfulness to the Great Commission is very dependent on our commitment to the great Commandment. Unless I love God with all my heart, my soul and my mind, I will not obey Him who says that all authority in heaven and on earth is given to Him and now He tells us what to do. Now I might love God with all my heart, my soul and my mind, but unless I love my neighbour as myself I will have no urgency in my heart to see my neighbour saved. Until I can take my skin off me and put it on my neighbour and see ‘me’ going to hell without Christ, I will not care for them. For the past year we at Logos have been settling down to be a congregation. We have sought to lay aside baggage from the past, to discover ourselves as a congregation. Now it is still early days as we will only be a year old in March. During 2012 we made no real effort to reach out and to draw people to Logos to join us in the great purpose of loving God and loving our neighbour, or as we say in our purpose statement; ‘to know God and to make Him known’. The text for this morning is all about the statement to make Him known. So what can we say about the Great Commission this morning. Firstly, it is based on the authority of Christ. Before we even look at verse 18 we need to look at verse 20, where Jesus says: “And behold, I am with you always, to the end of the age.” Now who is this one who says that He is with us always, even to the end of the age? It is the very one giving us the great commission, but more than that it is the very one who says in verse 18 that “all authority is given unto Him”. Now before we look at the rest of the section we need to stop and think right here. The one who will be giving us a command in verse 19 is not just anybody. It is not your pastor, it is not your boss at work, it is not a political leader but it is the Lord of Glory. But so often the Lord of Glory does not receive the glory that is due to his name. The human nature is inclined to obey man and to honour man rather than God. So, before telling us to do anything for him in v. 19, he tells us what he can do for us in v. 18. “All authority in heaven and on earth has been given to me." "Authority" means the right and power to do something. So Jesus means that he has absolute right and all power to do as he pleases in heaven and on earth. There is no authority in heaven which can call the will of Jesus into question, and there is no authority on earth that can call the will of Jesus into question. And no power on earth or in heaven can frustrate his will when he exerts all his power to achieve it. “All authority in heaven and on earth has been given to me. " Without this declaration of Jesus' authority, we could never venture confidently to make disciples. On what possible basis do we have any right to tell anybody they should change their whole way of thinking and acting and become a disciple of Jesus Christ? Only one thing could justify such outlandish proselytizing all over the world—that Jesus Christ rose from the dead and has been given an absolute authority over natural and supernatural forces so that every human and every angelic being will give an account to him. If Jesus has that kind of authority, then we Christians not only have the right but are bound by love to tell other people to change and become his disciples. Jesus has all authority in heaven and on earth; more than all the World leaders put together. He is the absolute sovereign of the universe, and one way or the other every knee will bow to him. I will explain each of the verbs which are each a sermon by themselves in detail under separate headings. In the meantime we need to take note of the structure of each of these verbs which are ‘go’, ‘make’, ‘baptise’ and ‘teach’. If we do not start here we will not understand the message. The question we need to ask is what is the command or the imperative in this section? This we will discover when we look at the Greek words which are: poreuthentes for ‘go’ mathyteusate for ‘make disciples’, baptisontes for ‘baptise’ and didaskontes for ‘teach’. Now notice the endings of the words. Mathyteusate ends with ‘ate’ and the rest of the words end with ‘ntes’. This indicates to us that the imperative or the command in this section is to ‘make disciples’ and the rest are all participles. Now, the question is, what does a participle do in the Greek language? Without getting too complicated, a participle is basically considered a "verbal adjective". It is often a word that ends with an "-ing" in English (such as "speaking," "having," or "seeing"). It can be used as an adjective, in that it can modify a noun (or substitute as a noun), or it can be used as an adverb and further explain or define the action of a verb. Poreuthentes for ‘go’ is an aorist participle, while the other participles are present active participles. This means that the text before us to give us better understanding can then be translated: “as you are going, or having gone, make disciples, baptising them and teaching them.” Now why is it important to waste our time with Greek stuff in a sermon on this? Is there a spiritual significance, is there a lesson in it or are we just being clever with the Greek. Well let’s then get to the points and try and drive a message home. Secondly, it is dependent on our going. The tendency amongst most Christians I know is to say that verse 19 tells certain people called ‘missionaries’ to go, and that is not my calling, as I am not a missionary, therefore I will not go and make disciples. What we have however seen in the text is that ‘go’ is a participle that defines the action of the main verb which is to ‘make disciples’. Now remember we retranslated the verse to say: “as you are going…..” or ‘having gone’. Now the implications for the disciples were major, and the implications for us are major. There is a general tendency amongst churches to argue in two ways when it comes to the task of missions. There are those churches who believe that charity starts at home and therefore we evangelise at home and make disciples at home and we pay a pastor to do that. Then there are those who believe we must go to the ends of the world and we pay a missionary to do that as they are called to go. The text however says, “as you are going”. Here is the message which I believe is for all of us. We are all called to make disciples as we are going, or wherever we find ourselves, whether our going is at home, or our going is at work, or our going is around Polokwane, or if we move to Pofaddder in the Cape, or New York in the USA or Bagdad in Iraq. Wherever you are, you are a Christian, and you need to reach out with the Gospel of Christ to unbelievers around you and make disciples of them. This fits with the Old Testament teaching about the Word of God in the family, Deuteronomy 6:6-7 (ESV) “6 And these words that I command you today shall be on your heart. 7 You shall teach them diligently to your children, and shall talk of them when you sit in your house, and when you walk by the way, and when you lie down, and when you rise.” It simply means teach the word of God to your children, when you are sitting at home, when you are walking by the way, when you are lying down and when you are rising for the day. It simply means this, wherever you are, teach your children, and the Great Commission is; wherever you are make disciples. Now among the disciples there were those who focused on a destiny, Paul was one like that, other disciples ended up in captivity and were placed around the world by the Romans, but wherever they were they made disciples. One of my personal frustrations is with professional missionaries. They will share the Word of God with people in foreign places if others pay for them, but when they are back at home they do nothing. Then you also find local church members who ache and love to go to other places, normally on the financial back of others, but at home they will never share their faith. I had a youth pastor years ago who had this phenomenal desire to go and do evangelism with ‘Sportsmen for Christ’ at the Barcelona Olympic Games, and obviously he wanted the church to pay his way. I refused because all the time he was with us he did not go out of his way once to share his faith in Polokwane. The church is not called to send people on missionary holidays. You want to do that you pay for yourself. I believe that if the church sees a person in their midst who has a heart for reaching the lost locally, we will be very quick to support them if they develop a heart for a group further afield. So, I am not opposed to target least reached people groups or lesser reach people groups, I am not opposed that we send somebody there, but we will be very unwise to send somebody who is not proving their worth at home. Look at the church of Antioch. Acts 13:1-3 (ESV) 1 Now there were in the church at Antioch prophets and teachers, Barnabas, Simeon who was called Niger, Lucius of Cyrene, Manaen a member of the court of Herod the tetrarch, and Saul. 2 While they were worshiping the Lord and fasting, the Holy Spirit said, “Set apart for me Barnabas and Saul for the work to which I have called them.” 3 Then after fasting and praying they laid their hands on them and sent them off.” Antioch sent off their best, not somebody who could not handle his local job, and therefore I will become a missionary. Do you want to see what a missionary at heart looks like? Paul was a missionary at heart. Let me give you an example. He writes a letter to Philemon with an appeal for somebody. Look at verse 10: “10 I appeal to you for my child, Onesimus, whose father I became in my imprisonment.” Onesimus was born again in prison, because Paul was not a professional missionary but a missionary at heart. Another way to say it is that mission work was in his DNA, and wherever you put Paul, whether it was before King Agrippa, or with Silas in prison or alone in prison, he could not stop making disciples. There is no culture and no religion beyond the authority of Jesus and therefore no culture and no religion beyond the Great Commission. So, with His absolute authority Jesus lays absolute claim on every person in every place, and He tells all of us to make disciples as we are going. That's the foundation of all missions, domestic and frontier, but by people who are going about or by people who are going for that specific purpose. Thirdly, it involves making disciples. Now remember our word study and we said that ‘mathyteusate’ is the imperative which means our commandment is to make disciples for Jesus ‘as we are going’. The most important word I think Jesus ever said about becoming a disciple was in Luke 14:27 (ESV) "27 Whoever does not bear his own cross and come after me cannot be my disciple." Bearing a cross does not mean primarily having hard times, or to have your mother in law visiting or a difficult church member, or that cancer in your body. It means going to Golgotha. It means dying with Christ—dying to the old attitudes of envy and strife and jealousy and anger and selfishness and pride; and turning to follow Jesus in newness of life. When we make disciples, we bid people to come and die to their old, destructive ways and to live for Jesus, who loved them and gave himself for them. So, when you become a disciple of Christ you realise that when you are on the cross that there is no going back to the old life, but only forward to what is to come. A disciple by the way is not a student of a teacher, but he who in a disciplined manner follows everything that his or her teacher teaches them. Many so called Christians warming up church pews around the world are not Disciples of Christ, they are simply learners or students of Christ. So our task is to make disciples, to share the gospel of Christ with them, to lead them to the throne of saving grace, and to disciple them to maturity. That brings us to the command to baptize in verse 19 based on the word ‘baptisontes’. The meaning of baptism develops out of this meaning of discipleship. If becoming a disciple of Jesus means dying to your old life and walking in newness of life with Christ as Jesus taught, then it's almost inevitable that the symbolic act of that conversion should come to signify a death and resurrection. And that's just what happened. Paul says in Romans 6:3-4 (ESV) “3 Do you not know that all of us who have been baptized into Christ Jesus were baptized into his death? 4 We were buried therefore with him by baptism into death, in order that, just as Christ was raised from the dead by the glory of the Father, we too might walk in newness of life.” So Jesus commands baptism as a normative part of disciple-making because baptism signifies in an outward way what it means to become a disciple—death to self-reliance and a new life of faith following Jesus. That is one of the reasons, besides the fact that it is totally unbiblical that we reject infant baptism. It is not commanded, it is not implied, there is no evidence, there is no hint of evidence, and there is no responsible Biblical way to defend infant baptism from Scripture. Now at the moment we do not have a baptistery, but we do have a few pools around, and if you pay my trip to Israel I will gladly baptise anyone in the Jordan River. When it says in verse 19 that we are to baptize in the name of the Father, the Son, and the Holy Spirit, I think the point is that every member of the Trinity is active in the conversion which baptism signifies. When a person becomes a disciple of Jesus, he relates in a new way to the entire Godhead. The Father becomes our heavenly Father, the Son our Lord, the Spirit our indwelling enabler. And in the act of baptism we submit ourselves to all three, and we pledge allegiance to all three. Verse 20 shows that making disciples means more than getting conversions and baptisms. The last participle ‘didaskontes’ is ‘teaching them’. Conversion and baptism are essential, but so is the on-going teaching of what Jesus taught. The new life of a disciple is a life of obedience to Jesus' commandments, or it is not a new life at all. It is worthless to acknowledge the lordship of Christ in baptism and then ignore his commandments. So all disciple-makers must be teachers, and disciples must be continual learners. And notice that the teaching is not to make them Baptists or Methodists or Logosists or whatever, it is not to teach them a few things. Verse 20 is clear: “20 teaching them to observe all that I have commanded you.” We must teach them all things. That is by the way why God gives you the gift of pastors and teachers in the body and that is why you support them financially. Look at Ephesians 4:11-16 (ESV) “11 And he gave the apostles, the prophets, the evangelists, the shepherds and teachers, 12 to equip the saints for the work of ministry, for building up the body of Christ, 13 until we all attain to the unity of the faith and of the knowledge of the Son of God, to mature manhood, to the measure of the stature of the fullness of Christ, " Why do you support them financially? 1 Timothy 5:17-18 (ESV) "17 Let the elders who rule well be considered worthy of double honor, especially those who labour in preaching and teaching. 18 For the Scripture says, “You shall not muzzle an ox when it treads out the grain,” and, “The labourer deserves his wages.” That is also why older men must teach younger men and older women younger women, and older Christians newer Christians, because discipleship is about teaching. But teaching people to obey Christ is not easy. Obeying Christ in all he commanded is harder yet. It requires tremendous spiritual power. And Christ was so gracious to leave us with a word of comfort and power: Matthew 28:20 (ESV) “And behold, I am with you always, to the end of the age.” He is not powerful and far away. Nor is he present and weak. But he is with us, and he is all-powerful—forever. The great commission is sandwiched in powerful grace, between verse 18 & 20 and so are we. So, let's dedicate ourselves afresh to obeying Jesus and making disciples. But let's do it by remembering that we are sandwiched in grace: the promise of his absolute authority and power on the one side, and the promise of his constant presence on the other. May 2013 be the year in which we all join hands to reach out and to draw people in as we seek to make disciples that will be willing to take up their cross and follow Jesus. You entered for worship and as you leave you leave into your mission field.